Redesigning your website carries a series of business risks that you’d never allow to take place in any other area of your organization. • Big Up Front Cost – You’re forced to commit between $15,000 and $75,000 (on average) without knowing exactly what you’re getting and whether it will actually be effective. • Vague Deliverables – With all the nuance and complexity involved in your organization and your website for that matter, nobody can possibly know every detail from the start. • Time and Resource Opportunity Costs – Redesigning your website gobbles up a bunch of time and energy. These are resources that are typically being taken away from daily duties. • Subjective Design Decisions – Choices are made based on past experience, what other sites are doing, or what your developer “thinks” will be effective. Nobody knows if this is going to be an ideal solution. There’s a much better way, I promise. With traditional website design, you don’t know what you’re getting, what you’re going to pay, and whether or not is will work well for you. It’s a huge leap of faith. Let’s look at the website redesign problem from a different perspective – aiming to avoid every one of the risks I just mentioned. Let’s find a way to get you up and running really quickly, stay on budget, and know with certainty that the site is performing optimally. Let’s make it a PROCESS rather than a PROJECT. 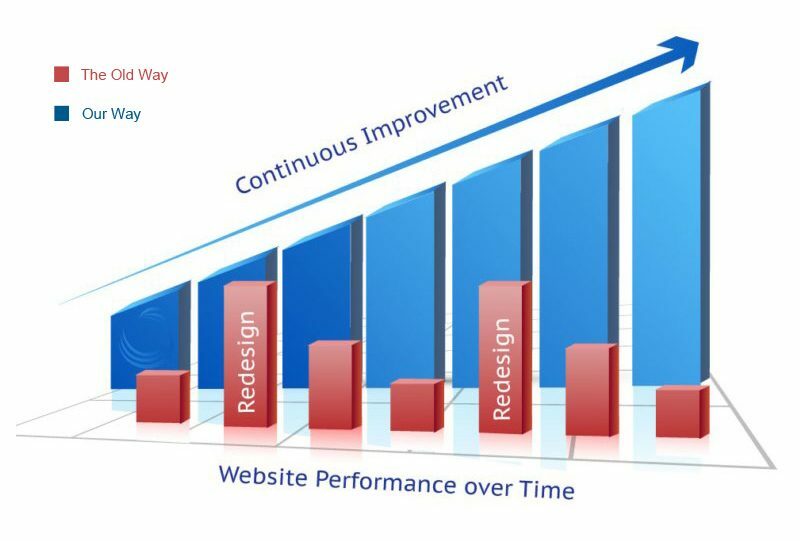 In theory, you shouldn’t ever need to “redesign” your website ever again. If an “ongoing” game plan sounds expensive to you, it’s not. Think about taking the dollars you’re looking to spend now on a website, and will then spend again in another 2-3 years on a redesign. Rather than writing big checks years apart, it’s better to amortize those dollars evenly over the time frame into flat monthly installments. Because your site always stays updated, it WILL produce value for you, and you’ll never redesign from scratch ever again. Value Driven Design is a brand new way of building and growing your website. As the name implies, the focus is on delivering value continually while minimizing risk to your business. 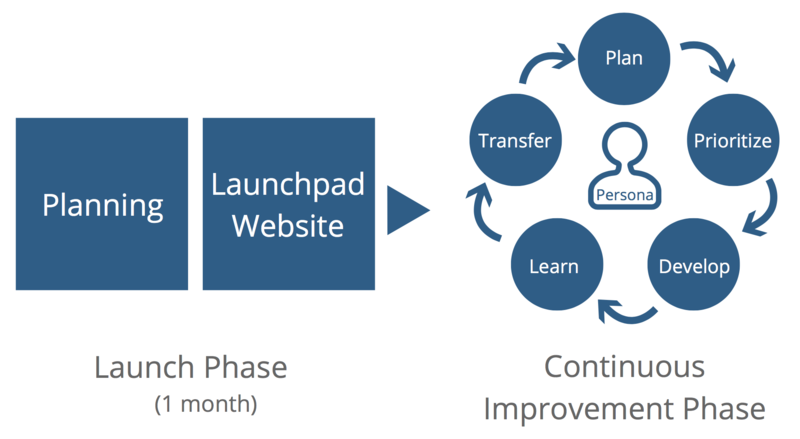 In the first month or two of work, the goal is to develop a launchpad website with a laser sharp focus on top level, immediate priorities only. The launchpad website is just the beginning. Once the site goes live, the second phase of continuous improvement begins – repeating cycles of planning, building and learning. The newly constructed website serves as the core for developing new pages, functionalities and assets of greatest value incrementally. The new site is also a testing ground to gather valuable user data for future decisions. 1. Minimize Business Risk – Reduce cash outlay, uncertainty and always explore areas of highest perceived impact on the organization. Get up and running quickly, using the website as a testing ground for hypothesis. 2. Continual Refinement – Use real data to evaluate past and present results, informing decisions on future website development ideas. With ongoing touches, the website will never become obsolete or stop delivering value. 3. Information Sharing – Communicate findings with the entire organization. Allow all marketing, sales and customer service operations to benefit from the metrics gathered through the website. If all this sounds way too good to be true, trust me it’s not. 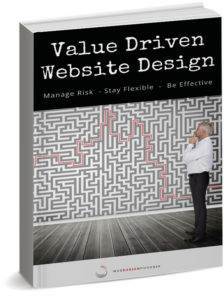 A logical next step is to chek out our complete ebook: Value Driven Website Design – Manage Risk, Stay Flexible, Be Effective. You might also want to scope out our website design portfolio for some past work and ideas for your own website project.